Genius Maxfire G-08X2 Game Pad, Ergonomic USB PC game pad provides great control, USB Plug&Play Copyright © 2019 ComXpert International CC - COPYING IS ONLY ALLOWED FOR THE PURPOSE OF SENDING US ENQUIRIES. E&OE. 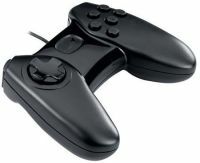 MaxFire G-08X2 is the latest gamepad from Genius especially designed for the PC fighting gamer. The streamlined, stylish shape fits fighting games perfectly. Eight programmable buttons on the top and front provide the best control for fighting games such “Street Fighter”, “The King of Fighters”, “Tekken” and “Soul Calibur”. Just plug MaxFire G-08X2 into the USB interface on your PC, and you’re ready to begin the battle immediately. The best price and guaranteed service and backup from official computer suppliers in South Africa for the MUL440 Genius Maxfire G-08X2 Game Pad. The Genius MUL440 Genius Maxfire G-08X2 Game Pad is available for R95. The product is sold by ComX Computers as new. Prices are valid today 2019-04-22 (before 2019-04-23 , by quote, while stocks last). The product is expected to be in stock, although this is not guaranteed. Find related MUL440 Genius Maxfire G-08X2 Game Pad products in our Game hardware Category for even more options. Read reviews and find out about MUL440 Genius Maxfire G-08X2 Game Pad. Discounts, specials and cheap prices only at ComX Computers.